What it is: A vitamin E-enriched mascara with an adjustable wand for variable lash length and product application. Beauty bonus: This mascara claims to be clump-free and really delivers on this. It went on completely smooth, leaving lashes looking naturally enhanced. Beauty bummer: If you're looking for over-the-top volume this product is not for you. Overall:This mascara is excellent for ladies who don't want the spidery, overdone eyes many other mascaras provide. 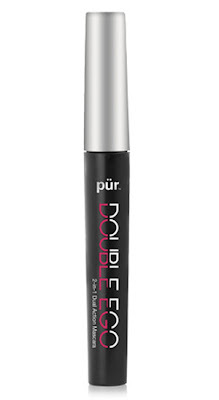 While I was very pleased with the Pur Minerals Double Ego 2-in-1 Dual Action Mascara overall, I did find the adjustable wand slightly messy during application. I also failed to notice any significant difference in my lashes after trying the two different applicator settings.